Theme: Being excluded from mainstream culture. Your students will see that mainstream culture often excludes people, and that there are ways they can help bring about change. Although it was Audrey’s idea to put on the play Cinderella, the others decide Audrey doesn’t look enough like Cinderella to play the lead. In anger, Audrey scribbles over the pictures in the Cinderella book. Mr. Allen, an African-American, sympathizes with Audrey and tells her he has felt left out and mad, too. He says anyone can play Cinderella, and that people are working to add diversity to literature so that young people can read about their own and other cultures. 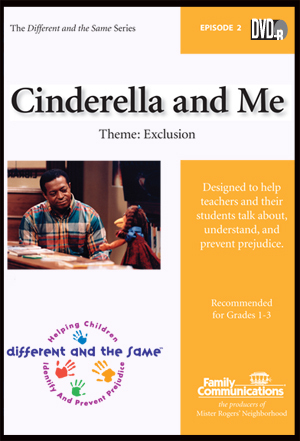 Activities:Encourage acceptance and inclusion with writing exercises, scientific and artistic analysis of skin color, and a new way to play musical chairs. The DVD has chapters, a PDF of the complete Teacher Guide and a Training Video and Guide.